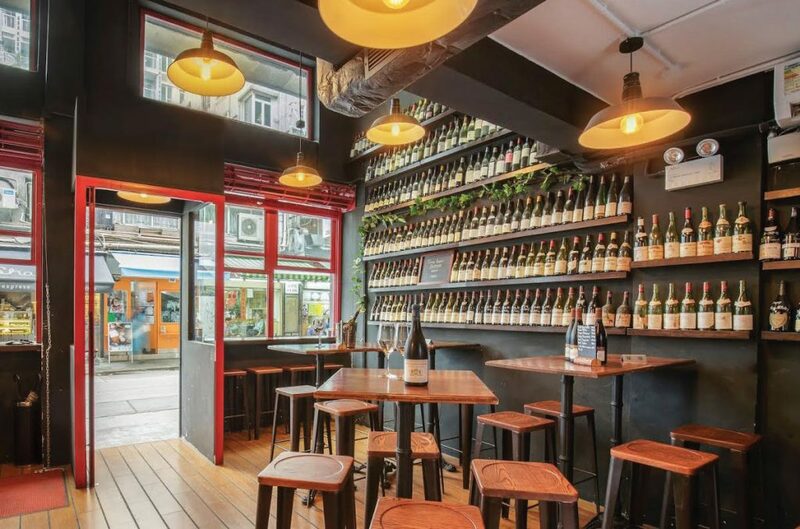 e most interesting are the wines from the less well-known regions such as Jura and Loire. 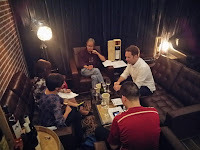 I read the wine list every time but always at the end ask recommendation from the friendly staff under the leadership of knowledgeable Chyson. 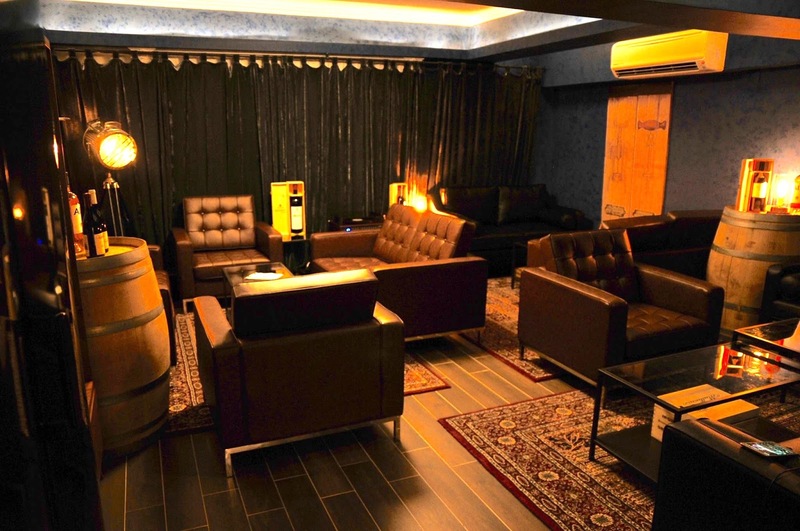 I have to say this is the most relaxing French wine bar in the city. Cheese and ham platters are served but customers can also takeaway any wine for an extra $100 per bottle to enjoy with their dinners elsewhere. Although perfectly enjoyable on its own, wine is considered as part of the meal in a social setting so wine and food pairing is always a talking point. 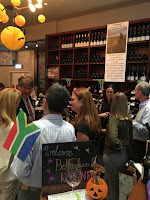 Producers, when developing a new market or approaching new customers, are often on the outlook of matching their wines with local cuisines; or try new combination to create excitement. The out-of-the box pairing I recently tried was Sauternes and Caviar. 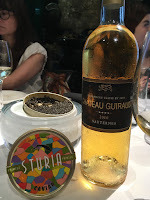 The wine was the Premier Grand Cru Classé Château Guiraud from Sauternes and the caviar was the haute couture Sturia Caviar from South West France. 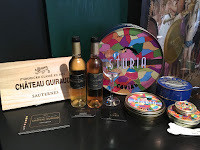 According to brand ambassadors Vincent de Beler from Château Guiraud and Yuna Tegani from Sturia Caviar, both companies share similar philosophy so to present both products together in a creative way just seems natural. Château Guiraud’s history dated back to 1766. It has been practising organic farming since 1991 and certification in 2011. While respecting terroir and tradition, the château also embraces changes to suit today’s consumer preferences. The wine style has changed from powerful and heavy to more elegant and pure. Sturia Caviar produces over half of the caviar in France (14 tons of the total 25 tons). Sturgeons are farmed from eggs for eight years before their roes are taken. Sturia takes care of the fish living conditions including ample space, water and nutrient quality to ensure they are healthy and produce top class roes. They also work with various chefs to produce caviar of different maturation to suit their needs. Like wine, caviar evolves with maturation period from almond to hazelnut and eventually cashew nut with intense flavour. 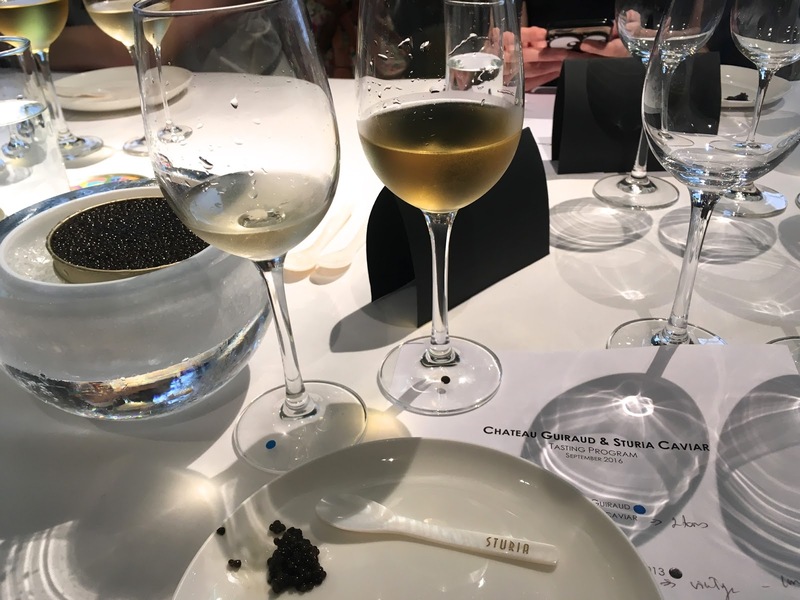 Returning to the theme—Sauternes and Caviar pairing. Vincent stressed that it was a sharing and discussion rather than imposing on us what is the best combination. Salty blue cheese and sweet wine is a classic pairing so it would be interesting to see how these salty roes fared with sweet wine. Château Guiraud 2002 with Vintage Caviar. 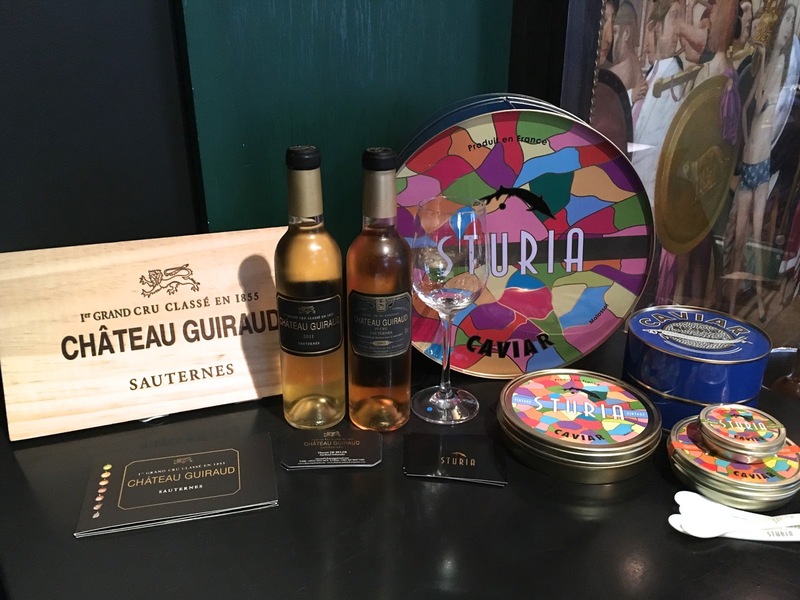 We all agreed that Château Guiraud 2002 and the Vintage Caviar (the signature of Sturia with six months maturation) was the best match. 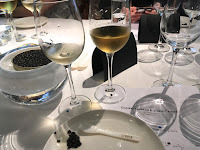 The Oscietra Caviar, also with six months maturation, was delicious on its own but a few of us felt it was too strong with all the wines, although some guests like it because the wine enhanced the taste of sea. The take of this exercise is that food and wine matching is fun and can be creative. We don’t need to like the same pairing but we can still sit around the table to share and discuss. Some consumers wary that their wine and food choice might not be acceptable by ‘professionals’ but we all have different palates and preferences so we should just follow our tastebuds rather than blindly led by others’ opinions. I may not choose caviar with Sauternes but hey, for those who want a little indulgence, why not? Most of us know that Domaines Barons de Rothschild (Lafite) or the DBR Lafite Group, owns various chateaux and have investments in other countries in addition to Lafite. However, few of us are aware of the Légende, a range of Bordeaux appellation wines mainly for the on-trade market. According to the group’s export director Michel Negrier, Lafite is an icon wine that wine lovers aspire to. 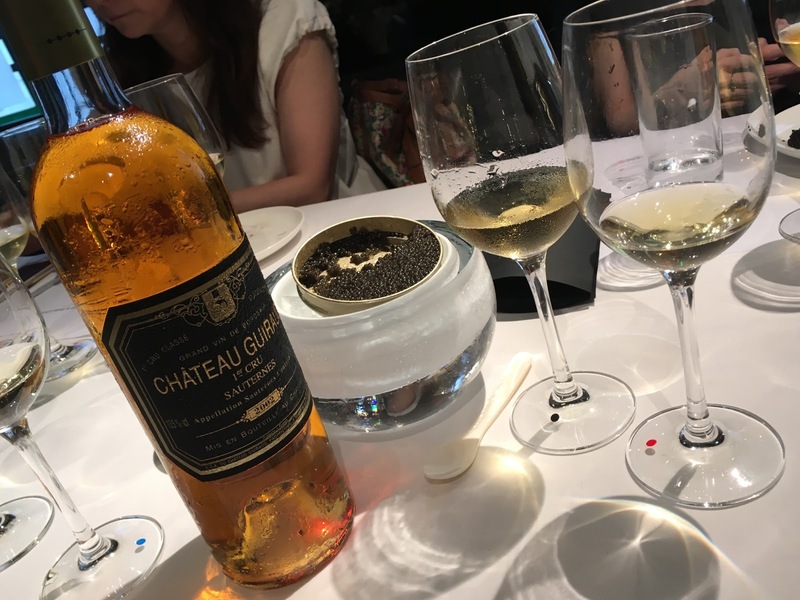 With increasing interests in wine from the younger generation in the 90s, the group decided to create a wine that combines the elegance of Lafite and an accessible price point for these consumers. First to decide is the name. It must be as easy to pronounce and remember as Lafite, and convey the message of tradition, modernity, history and terroir, and encourage discovery. Légende is the ideal name that lived up to the criteria. Légende Bordeaux Blanc 2015: a vibrant, easy drinking wine with no oak influence. The freshness of Sauvignon Blanc livens up the oiliness in food while the Semillon adds weight. Légende Bordeaux Rouge 2015: a Cabernet Sauvignon dominated wine that focuses on the purity of fruit, another easy drinking wine appeal to new drinkers. Légende Médoc 2014: Same blend as the Bordeaux Rouge with 60% Cabernet Sauvignon and 40% Merlot, the wine certainly shows the Médoc influence with more structure. Légende Saint-Emilion 2013: a well balanced wine with 95% Merlot. Velvety tannin, red fruits and a hint of spices. Légende Pauillac 2012: a wine with structure and elegance. Apparently the grapes were from Lafite’s vineyards, no wonder the wine is a league above the rest of the range. Michel said Légende is approachable, fun, easy to understand; about sharing with friends and discovering the Bordeaux terroir. Like NV champagne, it focuses on year on year consistency rather than highlighting vintage differences. In Michel’s word, Légende is the ladder to Lafite. While most consumers in the world would go the mainstream way to try the entry level wine first before moving up ladder, Chinese consumers tend to jump right onto the top of the ladder skipping the basic and intermediate levels. In my view, this is a wrong approach to wine as the palate of new drinkers are not used to the structure and complexity of first growth wines, and therefore would not fully appreciate the subtlety of these great wines. We need to be patient and climb the ladder step by step in order to fully understand and thus enjoy the wine at all levels and price points. 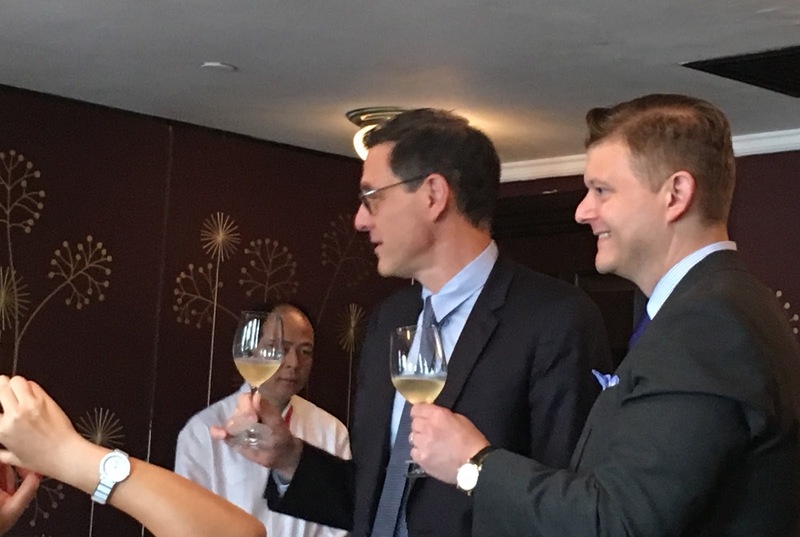 With Légende now officially launched, I hope young Chinese consumers would first make connection with Lafite’s younger brother before setting their eyes on Lafite itself. 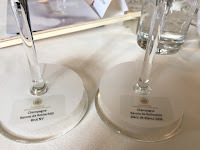 By the way, the Group also produces champagne in a ‘Lafite, Mouton and Baron Edmond de Rothschild’ family project under the name Champagne Barons de Rothschild. The bubbly certainly lived up to the reputation of the family. 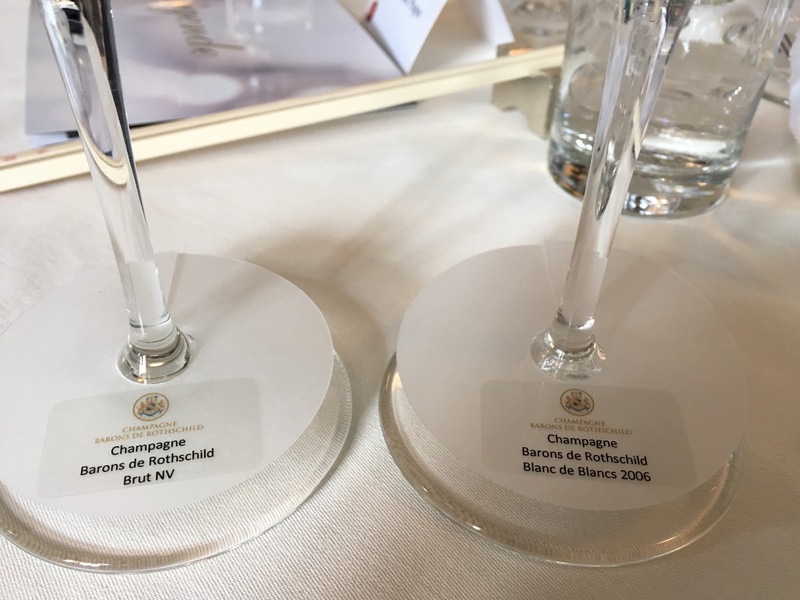 Both Légende and Champagne Barons de Rothschild are available from ASC.